Conditions that affect the Achilles tendon are most common in middle-aged patients living an active lifestyle. Athletes may also be more prone to suffering an Achilles injury. An injury or condition of the Achilles tendon can cause pain and discomfort from the ankle to the calf. A damaged Achilles can also limit ankle mobility and functionality. A severe injury to the Achilles tendon may even result in the rupturing of the Achilles. The Achilles is a tendon in the back of your ankle that attaches the heel to your leg muscle. The body’s tendons are comprised of flexible fibrous tissues that help to connect bone to muscle. The calf muscle is actually comprised of 2 individual muscles known as the soleus and gastrocnemius. The soleus is a wide muscle in the lower calf that sits under the gastrocnemius. The soleus muscle helps when flexing and pointing the toes downward. The gastrocnemius is the main muscle of the calf, which is responsible for flexing and moving the knee and foot. The gastrocnemius muscle extends to the thigh bone (femur) where it attaches at 2 separate points. Combined, these 2 muscles allow you to run, climb, and jump. What conditions can affect the Achilles tendon? There are a range of conditions that may affect the health of the Achilles. A sports-related injury may damage the Achilles tendon. Achilles conditions and injuries include Achilles bursitis, Achilles tendonitis, and an Achilles rupture. More severe Achilles conditions can cause sharp pain and a lack of ankle mobility. Bursae are fluid-filled pouches within the body that help to prevent excess friction between parts of the body that frequently rub together. Bursae are found in multiple parts of the body and allow for comfortable movement. There is a bursa located behind the heel bone, which is designed to reduce friction between the Achilles tendon and heel bone. When this bursa becomes inflamed, it is known as Achilles bursitis or retrocalcaneal bursitis. Bursitis of the Achilles is a common source of ankle and foot pain in runners and other athletes. If the muscles of the legs strongly contract, the Achilles tendon can become damaged due to pressure and strain. These types of injuries are common with sports involving running or jumping. An Achilles injury may occur when landing from a jump that forces the foot upward. Achilles tendonitis can cause pain to occur in the heel and lower leg. Achilles tendonitis is denoted by inflammation of the Achilles, which often causes the back of the ankle to appear swollen and sensitive. There are 2 types of Achilles tendonitis known as noninsertional Achilles tendonitis and insertional Achilles tendonitis. The type of Achilles tendonitis depends on which part of the tendon is damaged or becomes inflamed. Severe injury to the tendon may result in an Achilles rupture. A rupture in the Achilles often forms after a violent or forceful movement of the ankle. With age, many patients may experience degeneration of the Achilles tendon, which can put them at a higher risk for an Achilles injury or rupture. Patients with a history of Achilles injuries or Achilles tendonitis may be at a higher risk of suffering from an Achilles rupture. A fall onto the ankle can also cause the Achilles to rupture or tear. What causes an Achilles injury or condition? There are many reasons why a patient may suffer from an Achilles injury or Achilles condition. Generally, causes for an Achilles injury or condition stem from wear and tear on the tendon or a traumatic injury. In many cases, a combination of wear and tear and an accident cause damage to the Achilles. Inflammation of the Achilles may even be caused by overuse of the tendon or wearing shoes that do not properly fit your feet. With age, the Achilles becomes weaker and begins to degenerate. This can cause the Achilles to be more prone to injury. What are the symptoms of Achilles tendonitis or Achilles rupture? A common symptom of Achilles bursitis is inflammation and visible redness at the ankle. This is commonly accompanied by pain, discomfort, and irritation. Shoes and socks may make this pain or inflammation worse. With Achilles tendonitis, patients may experience a thickening of the Achilles tendon, which is usually tender and sensitive. Achilles rupture symptoms are often intense and severe. It is possible that a popping or snapping sensation can be both felt and heard at the time of the Achilles rupture. A strong pain may occur in the ankle and calf muscles. Another common symptom of Achilles rupture involves the leg swelling and an inability to properly move the toes. How can Dr. Rozbruch diagnose Achilles tendonitis or Achilles rupture? The majority of Achilles injuries and conditions can be diagnosed through physical examination of the ankle and tendon. Information about your previous health and any past Achilles injuries or conditions can help Dr. Rozbruch diagnose Achilles tendonitis, bursitis, or rupture. Dr. Rozbruch may ask you to move your ankle and foot in order to understand what motions are limited. Dr. Rozbruch may gently examine the ankle and apply slight pressure to detect an Achilles rupture. If he is unsure if the Achilles has been ruptured, an ankle MRI can help Dr. Rozbruch come to a proper diagnosis. Another form of medical imaging that can help diagnose an Achilles tear or rupture is an ultrasound. An ankle ultrasound uses sound waves to create a picture of the body’s anatomical structures. Ultrasound imaging can detect if the Achilles has been torn or completely ruptured. What nonsurgical Achilles tendonitis / rupture treatments are available? Dr. Rozbruch may suggest a nonsurgical Achilles treatment to alleviate the symptoms of Achilles tendonitis and Achilles bursitis. He may suggest resting the ankle, physical therapy, and anti-inflammatory medications to help reduce the inflammation and pain within the ankle. Physical therapy sessions can help alleviate the pain and swelling caused by Achilles tendonitis and Achilles bursitis. A small shoe insert may be used when walking to help take some pressure off the Achilles and calf muscles. What Achilles tendonitis / rupture surgeries are available? For some patients, Achilles surgery may be required to treat a more severe case of Achilles tendonitis. Achilles tendonitis surgery is often performed through an incision on the back of the ankle. Inflamed tissues are then removed from the Achilles tendon. Dr. Rozbruch will then split the tendon to remove any damaged portions of the Achilles. After these damaged tissues have been removed, Dr. Rozbruch will close the incision with stitches. Achilles surgery may be suggested for an Achilles rupture. 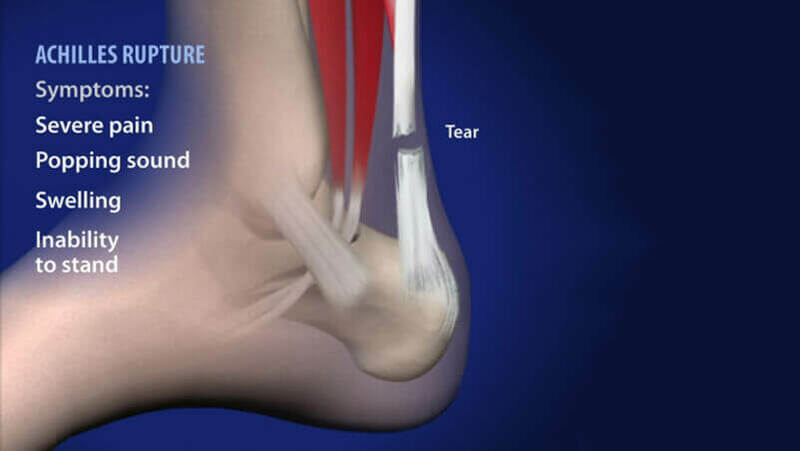 Dr. Rozbruch can repair and reattach the end of the Achilles tendon that is no longer connected due to an Achilles rupture. Achilles rupture surgery is also performed through an incision at the back of the ankle. The ruptured ends of the Achilles will be sewn together to reconnect it with the base of the Achilles. At the end of Achilles rupture surgery, Dr. Rozbruch will close the incision with stitches. What should I expect after an Achilles tendonitis / rupture treatment? Patients with mild symptoms of Achilles tendonitis or Achilles bursitis respond well to physical therapy for 2-4 weeks. Physical therapy will help to reduce any swelling or pain caused by an Achilles condition. In more severe cases of Achilles tendonitis, patients may continue physical therapy sessions for 2-3 months. Stretching is an important part of physical therapy, as the Achilles tendon may begin to constrict and shorten when injured. At first, your physical therapist will suggest only light stretches with more intensive stretches being added as your Achilles heals. As physical therapy progresses, strength exercises will be added to help tone the calf muscles. At the end of physical therapy, your physical therapist will provide you with exercises that you may do if your symptoms ever return. What should I expect after an Achilles tendonitis / rupture surgery? Recovery after Achilles surgery progresses more slowly. A protective cast or brace may be worn for 6-8 weeks following Achilles tendonitis or rupture surgery. This protective brace helps reduce irritation or friction on the incision of the ankle. Immediately after Achilles rupture surgery, crutches will need to be used as to not apply too much weight on your healing ankle. After the brace is removed, an elevated shoe may be suggested for 2 months, which helps to take some of the pressure off your ankle. Initial physical therapy sessions are concerned with retaining motion in the ankle. If the ankle is not moved while wearing the protective cast, patients may develop muscle stiffness or blood clots. The muscles of the leg may also become weaker if not regularly exercised as you heal. It is important to start physical therapy within a few days of Achilles surgery. Physical therapy after Achilles surgery may last 4-5 months until the ankle has healed significantly. As your ankle improves, strength exercises will be added to help promote proper mobility and muscle control. For athletes, more intensive exercises such as running, cycling, or jumping may be added towards the end of physical therapy. How can I learn more about Achilles tendonitis / rupture? To learn more about Achilles tendonitis / rupture, please request an appointment online or call Dr. Rozbruch’s orthopedic office in NYC at 212-744-9857. Prior to an office visit, please fill out Dr. Rozbruch’s patient forms to expedite your first visit.